St Andrew is one of five medieval churches in the Sudbury urban area, and there are several more separated from it by no more than a field or two. But two of the Sudbury churches are now redundant, and only St Gregory in the town centre is open every day. When I first came this way ten years ago I'd found St Andrew locked without a keyholder notice, but I'd been informed by several people that there was now a more enlightened attitude. Cornard is Sudbury's busy southern suburb, straggling along the road into Essex, and its church speaks more of the southern county than it does of Suffolk, the wooden broach spire a near-twin of that at lonely Great Henny a mile or two off across the river. Image niches at the west end would have contained statues in late medieval times, beneath which travellers might have stopped for private devotions. The west face of the tower sits hard against the road, and so it wasn't until we reached the churchyard that my heart sank. 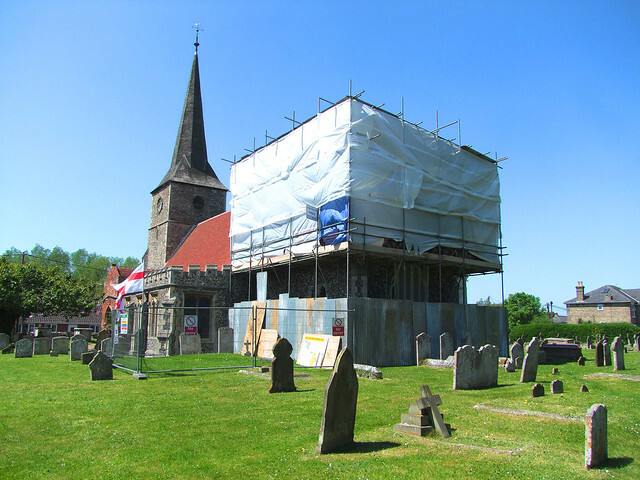 The entire chancel was under scaffolding, and that usually means an inaccessible church. Indeed, the porch was locked, but a nice lady cutting through the churchyard told us where the Rectory was. The Rector was very pleased to see us and to give us a go with the key, albeit warning us about the work going on in the chancel. And so it was that we hastened back along the high street. From this side you can see that St Andrew was substantially rebuilt during the 19th Century. The south aisle, to which we were heading, dates from the 1880s, and of course we could not see the chancel, although I remembered that it is largely still of the 14th Century. We unlocked the porch and stepped inside St Andrew. The first impression on passing through the south doorway is quite how little this church is. It has the aisles and arcades you would expect of a proud late medieval church, or a Victorian imagining of one, but everything is done on a small scale. My second impression was that this was a busy place which was well-used, giving a cluttered feel which was not unattractive. And then, turning towards the east, my eyes were caught by this church's one great treasure, a 1920 window by AJ Dix. It is outstanding of its kind, and compellingly modern. It illustrates the story of the sower who went forth to sow. The lower left section depicts Christ sowing seed broadcast from a basket ('A sower went forth to sow his seed' reads the caption), and then two angels gather in the harvest ('Some fell on good ground and sprang up and bare a hundredfold'). Only the traditional face of Christ betrays how close we are to the 19th Century. The faces of the muscular female angels carrying sheaths are utterly contemporary, as if they might be suffragettes. The story proceeds anticlockwise into the upper lights, where a horned devil grins wickedly as he sows tares ('Tares are the children of the wicked one'), and then two male angels burn the resulting weeds ('The harvest is the end of the world'). The subject seems to have been a popular one locally, and there is another good window at Colne Engaine, a few miles off in Essex, by Reginald Bell. There are a couple of 19th Century windows which are relatively mundane, but even with the chancel blocked off there was plenty of light inside the nave. I happened to know that the east window is fairly large with five lights, and so I expect this is never a gloomy place. Looking at the booklets and posters, and an impressive if startling painting of a crucified, winged Christ, I got the impression that this is a fairly radically evangelical community, and full of life. And Great Cornard has a history of radical action: this is one of just four Suffolk parishes which stood up to the puritan iconoclast William Dowsing. Dowsing arrived here early in the morning of 20th February 1644 - it was the first visit of a series he would make to churches in the Sudbury area over a period of four days. He must have been full of energy. He took up two brass inscriptions which asked for prayers for the souls of the dead, because the puritans considered these superstitious. He gave orders for the cross on the tower to be removed, and also that the chancel steps, which had been raised twenty years earlier during the Laudian attempt to reintroduce sacramental liturgy into the Church of England, should be levelled again. However, the churchwarden John Pain refused to pay for this work, and so Dowsing had him arrested. What happened to John Pain is not known, but he must have been a brave man.